I grew up in the American south. It never snowed. Therefore it must be absolutely fabulous to spend New Year’s Eve in Russia! When I was 20, my grandparents dropped me off at the airport to fly halfway around the world to satisfy an obsession. To get my parents to agree to the trip – which involved leaving my family in the middle of our annual holiday celebration, oh, and going to a completely foreign country by myself – I billed it as the adventure of a lifetime. I grew up in the south. It never snowed. Therefore it must be absolutely fabulous to spend New Year’s Eve in Russia! And also maybe once I’d been to the place, I’d stop trying to fascinate them with stories from my Russian history classes. I still remember what I was wearing – jeans, turtleneck, pullover, my warmest coat; I don’t remember if I slept on the plane – probably not. I arrived in Moscow on Dec. 31. It was already late when I checked into the Hotel Rossiya. I opened the window, which looked out over a small Orthodox church. It was snowing. I could see Red Square. I’m sure I didn’t run from the hotel across the cobblestones in the road into the square, but I remember it that way. And although I’m sure my coat wasn’t warm enough, I don’t remember being cold. It was nearly midnight and I was standing on the edge of the crowd by the Spassky Tower. It must have been crowded, but I remember having plenty of space. I looked up and watched the snow fall in that slightly psychedelic way precipitation appears through streetlights. All around me people were smiling and laughing, drinking and chatting in words I couldn’t understand. I’m sure I had that overfriendly look of the typical American tourist, and eventually someone took pity on me and taught me to say “s novym godom!” (Happy New Year!) Someone shot off a bottle rocket and it hit the voluminous sleeve of a woman’s fur coat – which promptly caught on fire. Others tried hitting her with something, but kept slipping on the cobblestones, which were covered in ice and champagne. Eventually jet lag caught up with the excitement and I staggered back to the Rossiya as if in a dream. But it wasn’t. And rather than being the trip of a lifetime, that first visit to Russia eventually brought about a whole new life. My 20-year-old self slipping on champagne couldn’t have known that seven years later she would watch the Red Square fireworks from the balcony of her Moscow apartment and spend New Year’s Day strolling around a city she had long called home. Or that even after returning to the United States, she would celebrate New Year’s every year with a big bowl of salat oliviye curled up on the couch watching the classic Smeshariki cartoon “Куда уходят старий год” (Where does the old year go?) 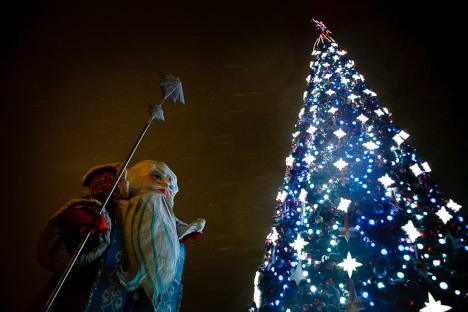 by the light of the елка (New Year tree).